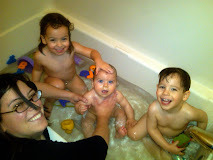 Ever since I found out I was pregnant with twins I have been enjoying reading blogs about twin mommyhood. Internet MoMs ("Moms of Multiples" - too cute) have freely shared their pregnancy fears, birth stories and day-to-day challenges for which I am grateful. I have decided to create this blog to share my stories not only as a mom but a career woman. I hope our families enjoy the photos and stories about our children but more importantly I want this blog to serve as a forum for all areas that affect working parents. My husband will be contributing some pieces - a guest financing column - and I intend to pull in news and events that affect working moms, especially "law moms". It may take me a little while to find my Voice but please come by frequently as I hope to update a few times a week. I noticed that at least one mom tried to start this sort of blog before at mommyesq.blogger.com but she only managed to put up a few posts before giving up.